Let’s finish off the week with another photo of a ruin. I visited this ruin back in January with my friend Rick when we hiked to Cave 7. 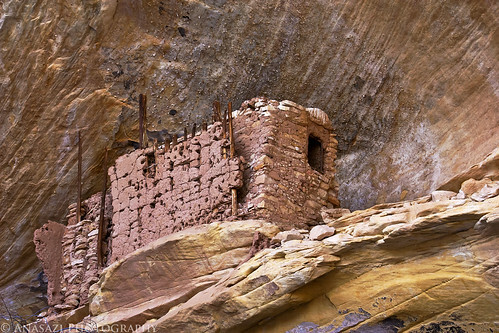 This little ruin is tucked away in an alcove near the head of the short side canyon the houses Cave 7. I named it the Pastel Alcove Ruin because of the pastel colors found in this particular alcove that really stand out to me. One of the more interesting parts of this ruin is the separate wall constructed from small wood beams and covered with mortar that is still standing next to the main part of the ruin.